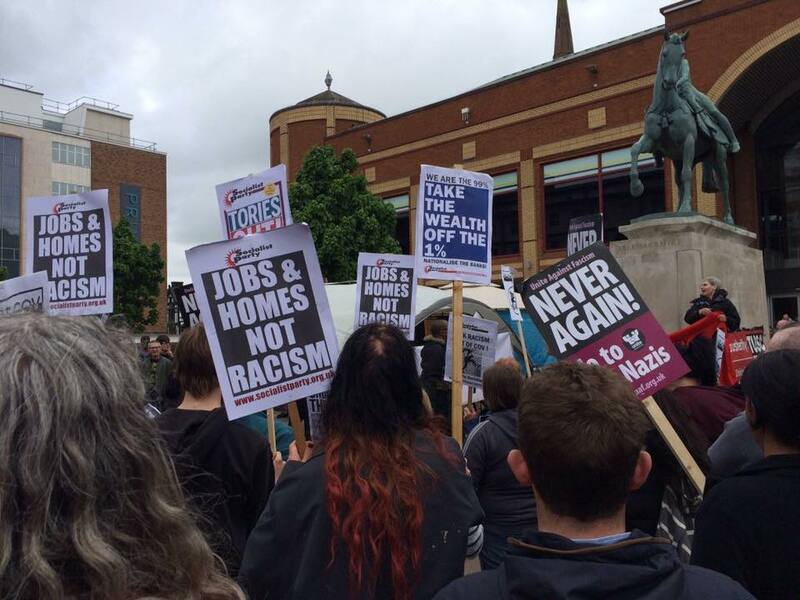 On Saturday 21st May the far right English Defence League came to Coventry with the agenda of dividing communities by trying to scapegoat ethnic and religious minorities for the ills in society, trying to turn worker against worker. However this did not happen. The people of Coventry would not allow it to happen. 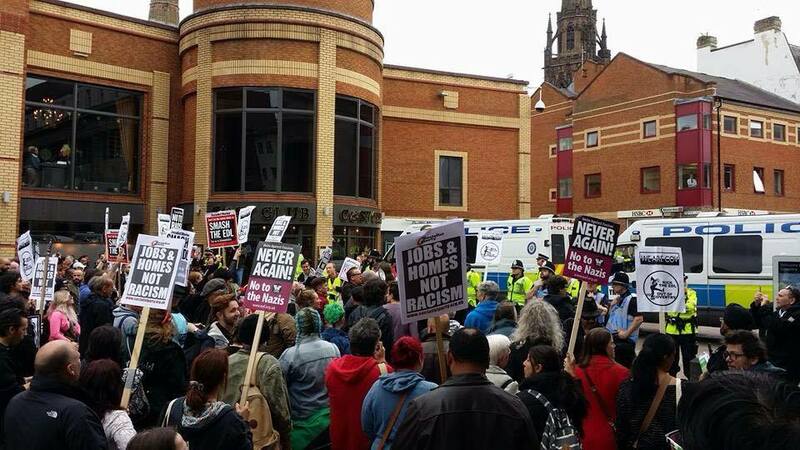 A counter protest was called by local anti-racists, supported by various campaign groups, trade unions, political organisations and local communities. The people of Coventry combated the EDL’s calls for division with solidarity and unity with hundreds attending the #wearecov demonstration in Broadgate. The attendance at the #wearecov gathering vastly outnumbered the EDL march and we also won a a victory by denying the EDL access to Broadgate Square, in the centre of the city. Today was a brilliant effort by all who attended the demonstration and is a solid basis from which to organise future events in the city. Members of the Socialist Party and Trade Unionist and Socialist Coalition built for the demonstration in the weeks beforehand and were present today. Party members distributed leaflets, placards and made speeches highlighting the connections between racism and capitalism. This socialist analysis really struck a chord with many participants looking for solutions to racism and the capitalist system itself. ‘You cannot have capitalism without racism’. If you agree with this, we urge you to fill in the form at the bottom, to join the struggle for socialism! KICK RACISM OUT OF COVENTRY! FIGHT FOR SOCIALISM! This Saturday the English Defence League (EDL) have come to Coventry with the intent to divide our communities and attempt to turn workers against each other through the use of racist rhetoric and playing on fearful insecurities. They come to Coventry – a city renowned for its anti-racist culture found in its famous Ska music to its many workers from around the world working side by side – to try intimidate and put the ills of society at the foot of religious and ethnic minorities. During these times of austerity, racism in its many forms, attempts to divide us. Today, as its weak and crumbling mouthpiece, the EDL attempts to shift the blame for austerity cuts on migrants and minorities in society. However it was not Pakistani nurses and Romanian bus drivers that caused the financial crash, and it’s not them pursuing an agenda of cuts and privatisation and attack workers on a daily basis. That role is reserved for exploitative bosses, the Tory government, and merciless capitalism. Every day workers in Britain face greater exploitation and see vital services, from the NHS to education, being cut by the Conservative government and passed on by Labour councils. While Britain is being run for the benefit of the 1% at the expense of the 99% this creates understandable and justified anger in society. However the far right try to capitalise on this anger by peddling simple lies being backed up by right-wing tabloids and politicians trying to divide and conquer over the 99% in society. But what does the likes of the EDL have to offer as an alternative to endless austerity in food bank Britain? Nothing! The EDL put forward no vision for reversing the cuts that destroy people’s lives, have no plan for housing, jobs, education, vital services but instead do the dirty work of the establishment by distracting people and misguiding the justified anger in society at fellow workers instead of bosses’ politicians. That is why it is so important for workers and youth to mobilise any time racism and fascism rears its ugly head in society, in order to cut across the vicious lies they put forward and to not let those truly to blame for society’s ills to get away with it. The EDL and the far-right will be defeated and driven back today, their lies exposed and attempt at division met with solidarity and unity. However racism in society will not just end and pack up its bags and go away. To truly end racism we cannot just merely treat the symptoms of racism – we must eradicate its causes. We must end exploitation, build houses for all, create secure and well paid jobs for all, distribute the £billions of society’s wealth to where it is needed most like health and education not just horded away by the super-rich. None of this is possible under the current race to bottom of this profit-driven capitalist system. We need a system that works in the interests of the 99% not the profits of the 1%!